Sometimes, a number can be said that’s meant to sound impressive, but upon closer inspection may actually be spectacularly unimpressive. Let’s take Elon Musk’s July 19 tweet in response to Needham’s downgrade of Tesla (NASDAQ:TSLA) stock: here. Let’s dissect what this may mean. In Tesla’s terminology, an “order” is when a deposit turns into a configuration. It’s when the deposit goes “hard.” For the Model 3, that was after the buyer added $2,500 to the $1,000 deposits, submitting the color and other options choices. In Tesla’s case, it said in its July 2 press release that it’s sitting on 420,000 Model 3 deposits. Does Elon Musk’s tweet mean that during last week it managed to convert 5,000 deposit holders into orders? Unless Tesla’s “order” terminology has changed, that’s what it appears to mean. With Tesla opening up the ability to every Model 3 deposit holder in the U.S. and Canada to configure, getting only 5,000 to convert to an actual order seems spectacularly unimpressive. If you assume 150,000 eligible (out of 420,000 total), that’s a conversion yield of only 3.3%. 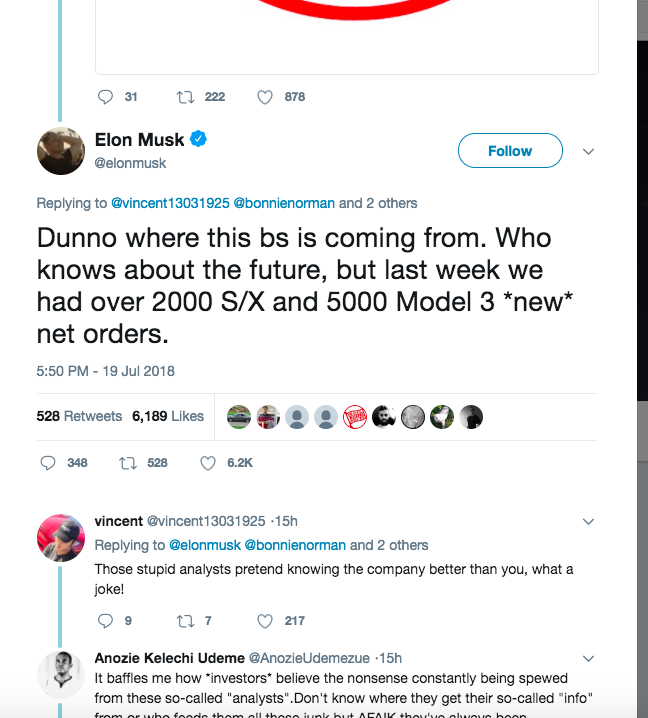 Getting 5,000 new orders per Elon’s tweet sounded impressive, but it actually seems like a disaster. No need to stand in line: Get your Model 3 in a month anyway. Too often lost in the numerous multidimensional debates around the Tesla Model 3 is the underpinning of the claimed 420,000 (per Tesla’s July 2 press release) deposits, and where it might be going from here. So much of the analysis has been focused on the production side of the equation, and for good reason – but now it’s time to come back to the demand, at least for a moment. Thousands of cars gathering dust in the desert, makes this question more urgent than ever: here. After all, this stock story hangs on there being vastly more demand than supply. If that bubble bursts, that’s a huge problem for the investment story – even before we get into the issue of profitability, the debt and working capital (balance sheet) and the constraints of the cash flow statement. The reason now is the time to discuss the demand for the Model 3 is because there are some amazing things happening following Tesla’s opening up of Model 3 ordering to everyone in the U.S. and Canada in steps between June 27 and early July. Basically, in the last few weeks. Montana Skeptic in his recent article – here – pointed to a thread with the a sample of people who had configured their cars and were getting them in as little as a week: here. The phenomenon is staggering, of people ordering the car and getting the car almost unbelievably quickly: here. I wrote “unbelievably” quickly precisely because it was so hard to believe. Wasn’t it the case that if you put down a deposit for a Model 3, you would have to wait at least around five months to get your car, and possibly closer to a year or even 18 months? That’s what my friends were told too, and then in some cases they are getting the Model 3 in “less” than one month. By golly, that means that the backlog is pretty much gone, no? You can’t order the $36,000 (including $1,000 delivery fee) version yet. You can’t order any Model 3 outside the US and Canada yet. Therefore, this doesn’t mean that Tesla suddenly is down to a few weeks of backlog quite yet. We really have to understand what portion of the 420,000 fall into those two buckets listed above ($36,000 version and outside North America). The problem is that there’s no fair way to just assume what those numbers are, for an outside observer. When it comes to the $36,000 version, Tesla itself doesn’t even know. When you put down your Model 3 deposit from March 2016 to June 2018, Tesla didn’t ask you for which version you were interested. Maybe some were interested only in the $36,000 version (with $7,500 Federal subsidy attached), whereas others were willing to pay $50,000 to more than $70,000. Tesla is finding this out right now, sort of just like the rest of us. For the people in the U.S. who are now asked to configure, some will delay, awaiting the ability to configure the $36,000 version in the December quarter. Some just haven’t decided yet. Others may have given up on the whole idea, but for whatever reason not asked for their $1,000 deposit back. Maybe some people forgot about the whole thing, deposit and all. We can debate this composition of the deposit backlog until the cows come home, but there is no objective or even convincing answer here – yet anyway. When it comes to the non-US/Canadian mix, the situation is a little different, but not much of help to us non-Tesla management people. Tesla obviously knows this mix, but it has not provided the number – or at least anytime remotely recently. Maybe they gave some vague indication at some point, but if so it was years ago. Really, they ought to report this mix with whatever precision the company has. It’s a key metric for investors, a huge importance to the valuation of the company. For example, how many reservations are from so-and-so addresses in China? In Nigeria? In Russia? And so forth. This is important, because investors deserve to get a sense of the “quality” of these reservations. If 50,000 reservations all come from one address in Shanghai or Beijing, then that’s probably something investors ought to know. If 75,000 reservations come from Nigeria, that would be equally of interest. And from Russia. And so forth. Speaking of flippers, why are there so many in the U.S.? Here is one site that’s dedicated to selling pre-owned Teslas: here. Why are there so many Model 3 units on the market, and why are they selling at such poor prices? It seems that the only obvious explanation is that there were many flippers, and the Model 3 flipping thesis has gone sour already. Why buy a Model 3 from a flipper when you get to buy one directly from the factory and get the car almost just as quickly? Of course, even after scrubbing the Model 3 deposit list from people who are somewhat obvious flippers and speculators, we would be left with the same question: How serious are the remaining deposit holders? And it’s not like it’s black and white, but just like in the U.S. and Canadian markets, it’s probably a gray scale reflecting the diversity in society as a whole: People have different circumstances and motivations for being interested in potentially buying a Model 3. Let’s say that a fair examination of the Model 3 deposit holder list would eliminate 120,000 as being “obvious” flippers and scamsters, who won’t consider buying the car unless they could resell it for meaningfully more than basically a risk-free transaction, aka arbitrage. That would leave us with 300,000 net, on a global basis. Then, assume half of those are in the U.S. and Canada, and the rest are elsewhere. We are then talking about 150,000 in North America and 150,000 overseas. As you can see in the table above, there were only 28,390 units sold by the time Tesla was able to deliver Model 3 cars in as little as approximately one month. The big picture here is that the North American $50,000-plus Model 3 backlog is essentially gone, with only a fraction of what could perhaps be 150,000 “real” serious deposits in the U.S.
Clearly, the balance must be, it would seem, those waiting to order a Model 3 that costs (closer to) the original $36,000 ($35,000 plus $1,000 mandatory delivery fee) price. But Musk said they can’t sell such a car without losing money, so what’s the point of having such a backlog in the first place? Some bears have been saying all along that we will never see that $36,000 Model 3. I disagree. I think we will see the $36,000 version delivered in the thousands – and we will see it perhaps even a hair sooner than the current year-end 2018 expectation. I think it may come as early as October or even late September. Why? Tesla just can’t afford to break this promise. The headline would be devastating. What Tesla can do, however, is to simply not sell very many of those money-losing $36,000 cars, at least for as long as it takes. Deliver a few cars, keep the public’s attention and interest, and then… well, we’ll cross that bridge when we get there. What’s the other thing Tesla will do now that U.S. sales of the Model 3 from the backlog pile have been basically exhausted? The answer seems obvious: Accelerate Model 3 exports to overseas markets! China may have just been effectively closed to U.S. auto exports thanks to the trade war and its punitive tariffs, but Europe remains open. So, send the Model 3 units there, a few months sooner than we were told and as little as within the last month. It would not surprise me if Tesla were to start European sales of the Model 3 in as little as two-three months from now, as opposed to end-of-year. I don’t see how Tesla has any choice, with the U.S. demand backlog having been fulfilled barely after mid-year 2018. These are probably two initiatives – starting to sell the $36,000 version earlier, and starting overseas sales earlier – that are likely to be part of the August 1 second quarter earnings report. I mean, why not use those potentially positive initiatives to distract from the horror shows that would be the income statement, balance sheet and cash flow statements? What will not be mentioned on the 2Q call, or any other time for that matter, is what the Model 3 deposit fiasco will have on Model Y deposits. Remember, Musk has said that the preliminary date for the Model Y unveil will be March 15, 2019, with production commencing one year later – the first half of 2020. The Model 3’s production was late. When Elon said, on July 28, 2017, that the car was in production, the assembly line was still months away from being fully installed. The $36,000 version, which was due to be delivered in 4Q 2017, was especially late. It will have been a year late, and when it does arrive, the quantity will be tiny. After all, why should Tesla deliver a car on which they say they’re losing money? Going forward, what’s the incentive to place a deposit for a Tesla years in advance? Apart from the very first tiny percentage of the total (under 30,000 out of the 455,000 peak deposit number as of a year ago) it clearly didn’t buy the Model 3 deposit holder anything. This is probably the most important point of all. By the time the Model Y gets unveiled – let alone delivered in any measurable volume a few years from now – there will be so much competition that it will be late to the party. That was unlike the Model S and X, that were unique – and mostly also unlike the Model 3, which only had the Chevrolet (NYSE:GM) Bolt EV to worry about in its first year. For those reasons, I don’t think people will be as motivated to place a deposit for the Model Y, as they were for the Model 3. And that’s a big problem for a momentum stock like TSLA: Negative momentum. Disclosure: I am/we are short TSLA. Additional disclosure: At the time of submitting this article for publication, the author was short TSLA. However, positions can change at any time. The author regularly attends press conferences, new vehicle launches and equivalent, hosted by most major automakers.